While the concept of MTF may seem very complicated, I'll try to make it easy for you to understand. In short, MTF is a measurement of the optical performance of a lens. More specifically, MTF shows the ability of a lens to resolve detail and transmit contrast (light colors remain light and dark colors remain dark). MTF is the acronym for "Modulation Transfer Function". 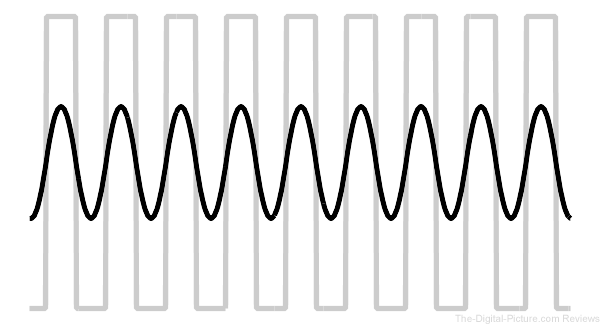 Modulation refers to change. One of the definitions that Dictionary.com provides for modulate is "to regulate by or adjust to a certain measure or proportion; soften; tone down." Ideally, the lens would not "adjust" the light or "soften" the details being transmitted, but this is a goal that is impossible to realize and no lens has a perfect MTF score. MTF is often tested using a bar chart as shown below. 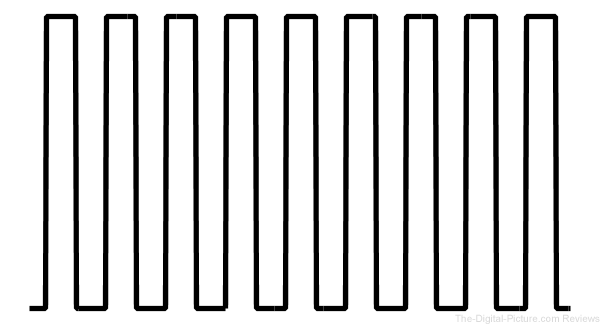 Black and white bars (basically thick parallel lines) are precisely printed or projected with very specific widths, measured in line pairs (a bar of each color) per millimeter or "lp/mm". 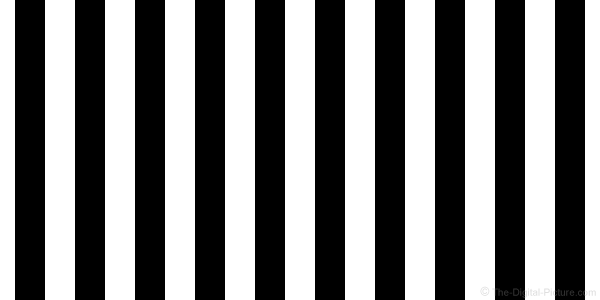 These test patterns are transmitted through a lens and the output is measured. The sharp transitions in the chart equate to sharp transitions in image details. No misconceptions: that is perfection, and perfection does not exist in the optics world. A lens will impart some blur and reduced amounts of contrast. The blur examples above are simply illustrations created in Photoshop using the lens blur function (no contrast reduction shown). While not real world results, they nicely illustrate the point. As the blur increases, the white and black bars begin to overlap, blurring together, leaving no pure white or black areas. The difference between the brightest and darkest regions diminishes. The graph of brightness values across the image becomes a sine wave with significantly reduced amplitude. The ratio of the result's brightness to darkness difference compared to the original difference forms the MTF value. Using pixel brightness, we can say that the "Bar Chart" example has brightness levels from 0 to 255 for a difference of 255. In the "Blurred 4" example, the results have a brightness range of 78 to 176 for a difference of 98. Divide 98 by 255 for a demonstration MTF of .38 at 10 line pairs per picture height (lp/ph). Make the black and white bars thinner and the black and white color more readily overlaps in the result. Thus, increasing the line pairs per millimeter (lp/mm), the spatial frequency, reduces the MTF score. The chart above illustrates MTF reduction with increased spatial frequency. Sagittal refers to lines radiating from center to the image circle periphery. 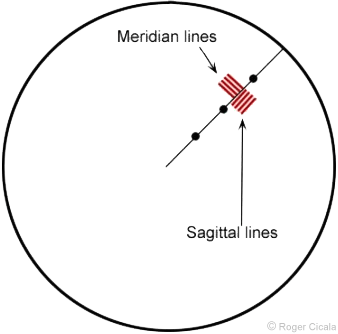 Tangential (or meridional) lines are perpendicular to the sagittal lines. Because not all lenses focus lines of both directions equally on the same plane, Sagittal and Tangential measurements for the same lens can differ. Wide open aperture MTF results are initially available for all lenses in the database. As lenses are stopped down, their aberrations are reduced (though the influence of diffraction becomes stronger as the aperture narrows). Keep this fact in mind when, for example, comparing a wide f/1.4 prime lens and an f/2.8 zoom lens. Comparing identical apertures is the ideal option. Also note that most zoom lenses perform at least slightly differently throughout their focal length range. Comparing lenses at the same (or similar) focal length is optimum. The solid lines show tangential MTF measurements while the dotted lines show sagittal MTF. The left side of the chart shows the center-of-the-image-circle measurement and transitions to the right side showing the peripheral measurement (corner of the frame) with the distance from the center of the image circle shown in millimeters at the bottom of the graph. The higher the lines, the higher the MTF measurement and the better the lens performs in regards to resolution and contrast with 1.0 being perfect. When the lines get crushed into the top of the chart, the lens promises to be amazing. For each set of tests, spatial frequencies (lp/mm) evaluated are 10, 20, 30, 40, and 50 lp/mm. 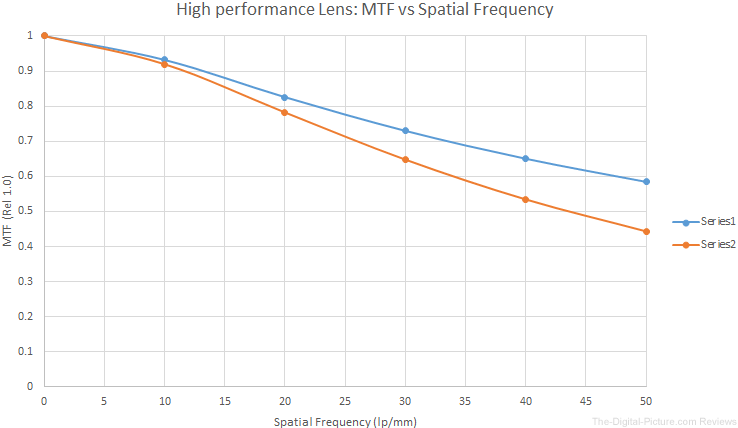 Because higher spatial frequencies are more demanding on a lens, they result in lower MTF scores. Also (usually) having lower scores are the periphery measurements (chromatic aberration is one common cause). Most lenses perform best in the center, causing the results to curve downward to the right. So what should you be looking for in an MTF chart? In short, higher, flatter lines are optimal because they represent a lens which is closer to perfect. Which lp/mm Lines Should I be Most Concerned With? 10 lp/mm strongly correlates to image contrast on a Full-Frame 24x36mm sensor and 30 lp/mm strongly correlates to image resolution. The 20 lp/mm result is more contrast-like for APS-C and Micro Four-Thirds, or if you zoom in on a Full-Frame image, crop significantly, etc. A very pixel dense sensor such as the 5DsR is closer to sampling the image from the lens at 50 lp/mm in terms of resolution or pixel-for-pixel detail. 10 lp/mm > 0.9 is high contrast and punchy, hard to tell lenses measuring this high apart in terms of contrast. 10 lp/mm < 0.75 looks quite hazy and "soft"
These are not absolute rules, and importantly, they are not very accurate if the lens and sensor do not behave well together. For example, in a symmetrical wide-angle lens with a very high angle of incidence on the sensor in the corner. For the most part though, they do agree with our experience and the ISO 12233 chart results on this website. The average of the tangential and sagittal planes is more important in the real world than either plane by itself, and chances are if even one of them is very high, the lens will look sharp. Extreme astigmatism is noticeable on a chart, but 3D subjects are less clear-cut. There are initially two chart types available on the site. The first chart type (shown above) provides the "Average" results for a lens and the second shows the "Variance" within a lens model. With grossly decentered or tilted lenses removed from contention, 10 lenses of each model are selected for testing (at wide open aperture). Each lens is then measured by a high precision Trioptics Imagemaster MTF bench. Measurements are taken at 20 points from one edge to the other and repeated at 4 different rotations (0, 45, 90, and 135 degrees) to provide a complete picture of the lens. The 4 rotation values are then averaged for each copy. The averages for 10 copies of the same lens model (for wide open apertures) are then averaged, giving an average MTF curve for the 10 copies of that lens. Lens MTF testing is performed at infinity focus distance (which often, but not necessarily, reflects closer performance). Because no two lenses are perfectly identical, it is helpful to know how much variance exists within a specific lens model. A simple way to determine variance is to calculate the standard deviation at each image height. In theory (more of a reasonable rule of thumb in this case), MTF results for most copies of this lens would fall within the shaded areas. 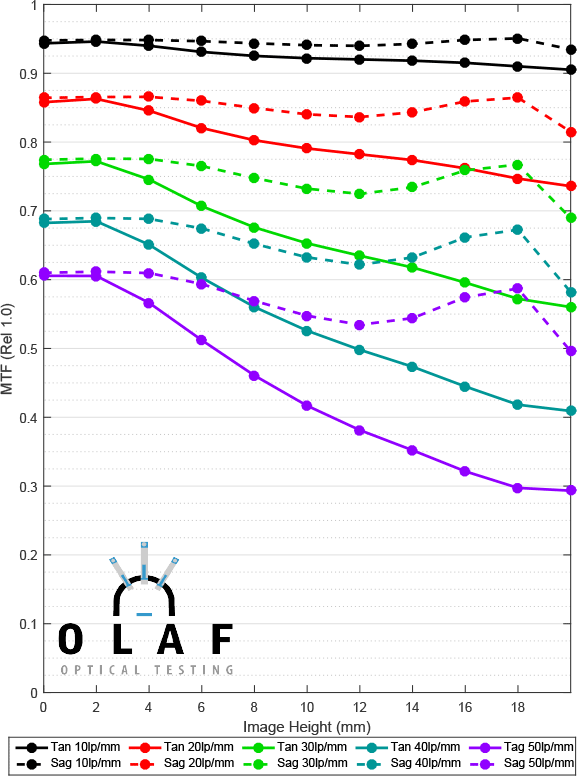 Olaf has chosen to scale the variance chart by adding 1.0 to the 10 lp/mm value, 0.9 to the 20 lp/mm value, 0.75 to 30 lp/mm, 0.4 to 40 lp/mm, and 0.15 to 50 lp/mm. These numbers were selected simply because they make the graphs readable for a "typical" lens. Lenses are far too complex to apply a single number rating to, and the MTF variance score represents one specific aspect of a lens model: copy-to-copy MTF variation. It's a fairly straightforward process to find the number of standard deviations needed to satisfy some absolute limits, for example, +/-12.5%. Just using the absolute standard deviation number though, would penalize lenses with high MTF. If the absolute MTF is 0.1, there's not much room to go up or down while if it's 0.6, there's lots of room to change. This meant bad lenses would seem to have low variation scores while good lenses would have higher scores. So we made the Variation number relative to the lens' measured MTF, rather than an absolute variation. We simulated the score for lenses of increasingly high resolution and saw the score would rise exponentially, so we take the square root of it to make it close to linear. Initially we thought we'd just find the worst area of variability for each lens, but we realized some lenses have low variation across most of the image plane and then vary dramatically in the last mm or two. Using the worst location made these lenses seem worse than lenses that varied a fair amount in the center. So we decided to average the lens' MTF across the entire image plane. To keep the math reasonable, we calculated the number just for the 30 line pair per mm (green area in the graphs) variance, since that is closest to the Nyquist frequency of 24MP-class full-frame sensors. Not to mention, higher frequencies tend to have massive variation in many lenses, while lower frequencies have less variation; 30lp/mm provides a good balance. Since some lenses have more variation in the tangential plane and others the sagittal, we pick the worse of the two image planes to generate the variance number. How Much of a Difference Matters? A high score means there is little variation between copies. If a lens has a variance number of over 7, all copies are pretty similar. If it has a number less than 4, there's a lot of difference between copies. Most lenses are somewhere in between. 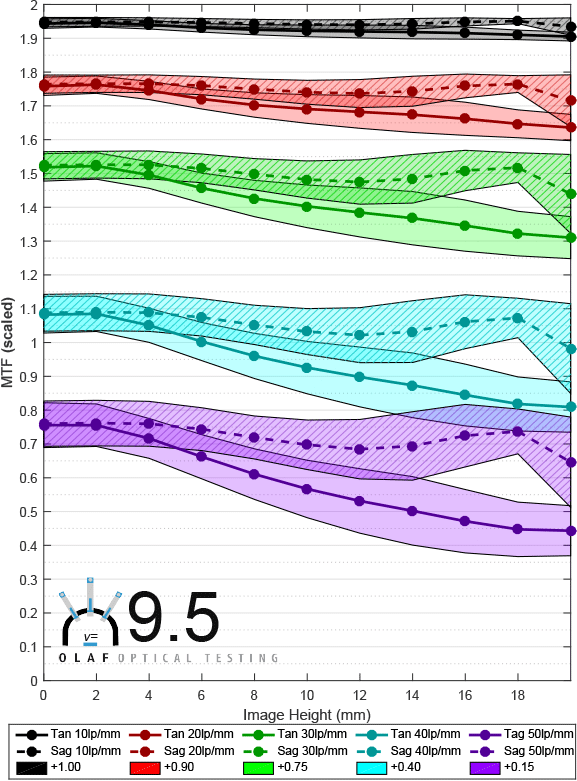 A difference of "0.5" between two lenses seems to agree with our testing experience when we line up dozens of copies of a lens and test them on ISO 12233 charts one after another. If the variance number is greater than "0.5" we generally notice the slight variation between copies, if it's less than that, we generally don't. Ten copies of each lens is the most we have the resources to do right now. That's not enough to do rigid statistical analysis, but it does give us a reasonable idea. Using the site's MTF Comparison Tool is easy. First select the type of graph you wish to display, "Average" or "Variance", using the drop-down box at the top of the page. The tool will (for most) remember the last chart type used and load that type by default the next time the tool is opened. Next, use the top left drop-down menu to select a lens you are interested in. While it is great to see the MTF results for a specific lens, it is even better to be able to compare the results with another lens. Simply select the comparison lens using the near-top right lens selection drop-down menu. The default results for both lenses will then be loaded. To select which chart shows, move the mouse pointed over or off of the chart. Alternatively, use the left and right arrow buttons. The little pointer between the arrow buttons will indicate which lens results are currently displayed. If more than one focal length or aperture has test results available, the drop-down menu options for either or both will be enabled. Remember that equivalents are best to use for comparative lens selection purposes. Note that the MTF measurements presented here do not account for the camera's contribution to overall experienced MTF. Lens MTF multiplied by the camera's overall MTF equals final experienced MTF. That said, lenses account very significantly for final image quality. So does AF performance (unless of course MF is being used). Also remember that one single lens (or group of lenses) may not perform at the top of the variance chart throughout the entire image circle. Some lens copies will boost the left side of the graph while the right side may be pushed up by other lenses. One could go crazy selecting and testing lenses. Your goal is to make amazing images and the effort required to find the ultimate copy of a lens is not likely worthwhile. Use the data provided here for purchase and rental decisions. As long as the lens you receive has no significant problems, focus on making those amazing images. The test results shown in this tool are provided under agreement by Roger Cicala and his crew at Olaf Optical Testing with support provided by LensRentals.com, the world's most awesome camera gear rental company. Go try out the MTF Comparison Tool!